A symposium co-sponsored by the Justice Action Center, the American Constitution Society, and the Federalist Society. Hosted by the Justice Action Center at New York Law School and the New York Law School Law Review. Admission to the Symposium is free for NYLS faculty, staff, students and alumni, and for non-NYLS students with school I.D. General admission is $25.00 for non-students who are not affiliated with NYLS. This CLE program has been approved for a maximum of six hours of CLE credit in professional practice for both transitional and non-transitional attorneys. New York Law School offers tuition assistance for attorneys who may have difficulty attending CLE events due to cost considerations. Click here to see if you qualify. This panel will discuss the appropriate scope of and limits on the powers of each branch of government since 9/11, including specific exercises of power by each branch that some have criticized as violating the Constitution’s checks and balances. 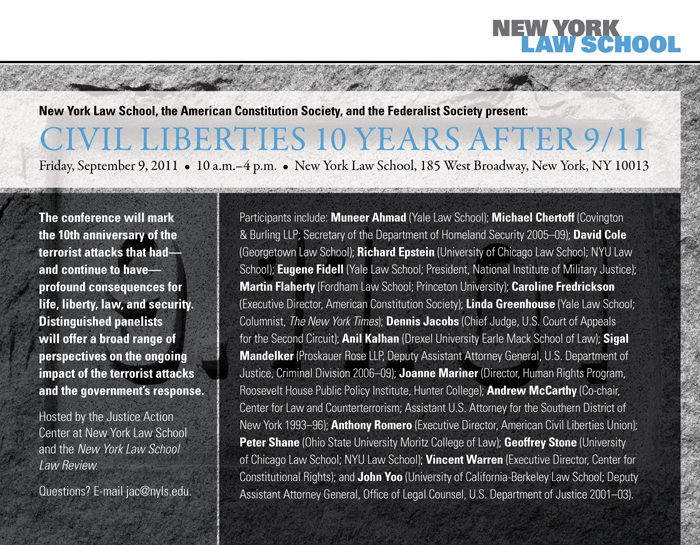 Panel 2: National Security and Civil Liberties: A Decade of Striking a Delicate Balance, or a False Choice? This panel will address not only the overarching (alleged) tensions between liberty and security, but also specific measures that the government has implemented since 9/11 that affect particular civil liberties as well as the rights of particular groups of individuals. This panel will begin immediately after lunch is cleared and may start as early as 2:00 p.m. This panel will discuss efforts to bring to justice individuals who have been accused of responsibility for the 9/11 attacks and other actual or planned acts of terrorism, as well as government and military officials and their contractors who have been accused of abuses. It will consider the appropriate judicial and non-judicial forums and procedures for ensuring that those who are responsible for acts of war, crimes, and abuses of power will be held accountable, consistent with principles of fairness and justice, and that those unjustly accused are exonerated.